The Telecom Application Developer Hackathon, or TADHack for short, took place over 6-7th June in Madrid and almost the entire Fairwaves technical team were in attendance. 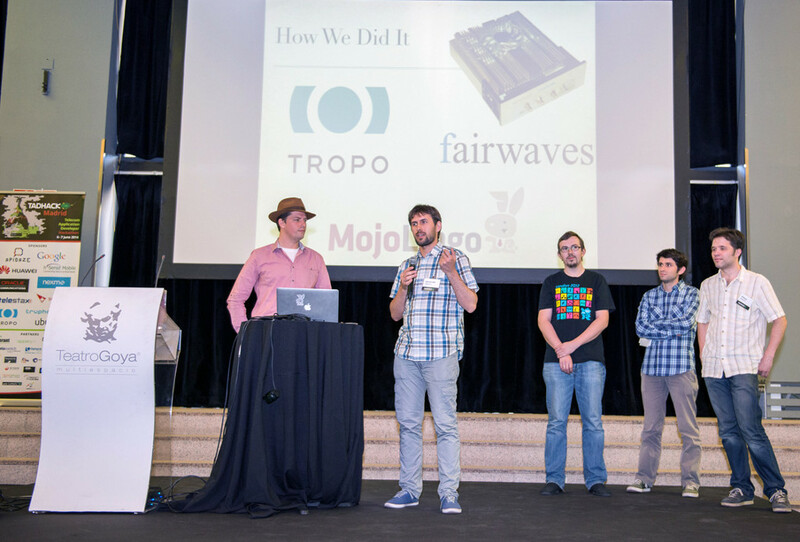 For the hackathon Fairwaves engineers collaborated with Ben Klang, founder of real-time communication specialists, Mojo Lingo, and Jose de Castro of Tropo, on the development of an in-network application service called FairShare Community Mobile. This aims to alleviate the problem of mobile network saturation where resources are scarce and costs may be high — such as is often the case in developing nations — through ensuring fair use of resources by managing call duration. The collaboration resulted in a working prototype which was demonstrated live, using a UmTRX-based BTS, and which went on to win the Geeks Without Bounds Challenge Prize.